What kind of palindrome-a-phobe doesn't like naan? Not me. 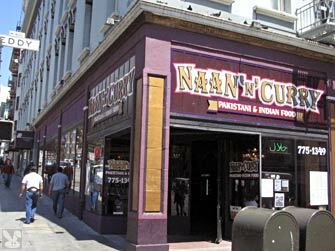 When I want curry in a hurry I head for the 'n'. Service: Order at the counter and indicate your table number (easily readable on their little stands.) 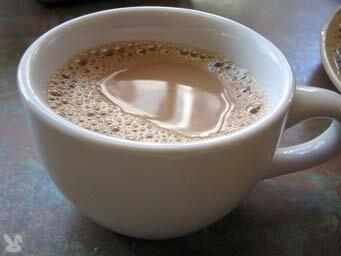 If you don't know what you want to eat, take a menu to a table and peruse, go to the counter and order and grab a cup of self serve chai on the way back to your table. The people who work here are super nice. It's not like your normal eat-it-and-beat-it place where they are just trying to turn your table and have that don't-let-the-tandoori-hit-you-on-your-way-out attitude. They are really on the ball here. 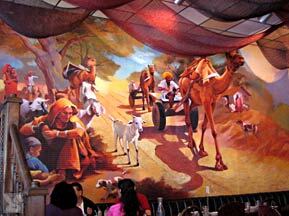 Atmosphere: Do you like camel murals? Do you like fabric draped overhead? If so, you have come to the right place. This ultra casual place doesn't not come up short on personality. 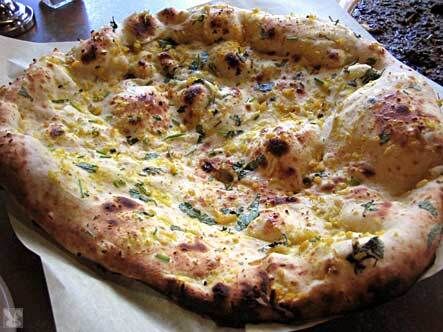 This toasty round of Indian bread is freckled with yellow bits of pungent garlic. Nicely browned and perfect for sopping up juicey puddles of sauce. 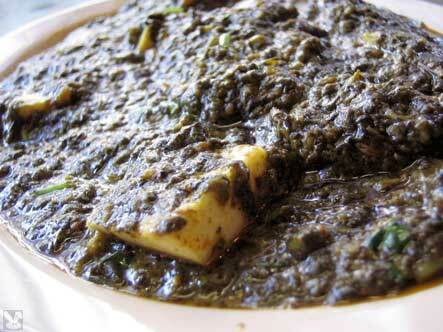 Spinach cooked down to a melting, dark green magma that engulfs dotless dice of housemade Paneer. Nicely spiced, this vegetable dish leaves the requisite pool of oil in your spoon's wake. Delish. Although the chicken was a teensy bit dry, the wonderfully spiced sauce with a subtle heat made up for it. The bittermelon was cut into ribbons and cooked to a savory, tenderness that lent moisture to the bits of bird. Hidee Ho! 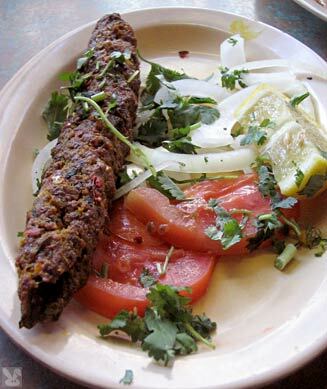 Okay, this is the rudest presentation of a dish imaginable, but it is a skewered ground lamb stick, so I guess it's best just to cut it up and make believe it never looked like this. They marinate and spice this meaty treat before baking it in their clay oven. Give a squeeze of lemon and it's mighty tasty. The tomatoes, raw onions and cilantro round out this aggressively flavored Mr. Hanky style meal. This is a small San Francisco and Berkeley chain. 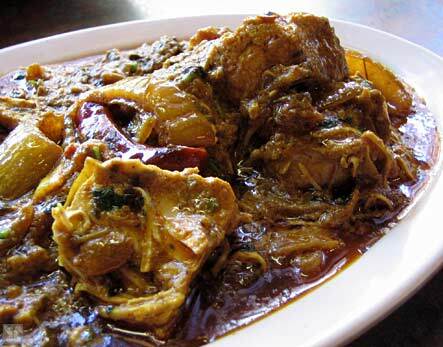 There are devotees who prefer the renditions (of the same dish) in one branch over another. 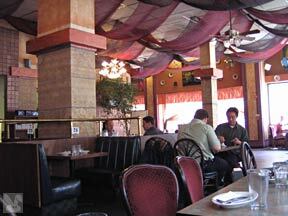 But most would agree that the food is tasty and the prices are low. There is toilet paper, but as far as the other paper products go, it's a crap shoot.